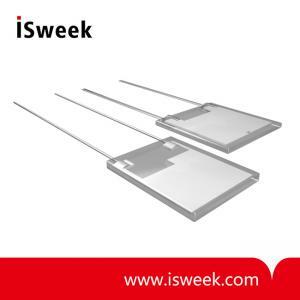 The SH relative humidity sensing element consists of a system of electrodes on a glass-ceramic substrate, covered by a humidity-sensitive polymer coating and a water-vapor permeable metallic membrane. This coating system represents a humidity-dependent capacitor. Utilizing the principal of capacitive measurement, SH measures relative humidity in air or other non-aggressive gases and gas mixtures with good long-term stability and linearity, small hysteresis, and excellent dynamic response.